If the thought of gourmet, handmade Viennese chocolates makes you dribble at the mouth, wait till you have a peak through the large window of Xocolat Manufaktur, Vienna’s latest chocolate hotspot. Even before you set foot in the door of the ninth district’s Xocolat Manufaktur, there is no doubt that this is a special place where gourmet chocolates are lovingly created by hand. Look through the large window on Servitengasse 5 and you’ll see chocolatiers at work – rolling out, shaping and drizzling chocolate on giant marble tables. Luxury confectionary made by hand – this is the simple proposition by this new chocolatier in the city. So where has this passion for chocolate come from? Xocolat Manufactur is in fact the brainchild of Christian Petz (award-winning former head chef of Palais Coburg,Vienna’s famous luxury hotel), as well as Werner Meisinger and Ramona Mahr who have both honed their skills at some of the country’s best chocolate makers. All of the chocolate sensations are available for sale in their chocolate boutique located in a venerable old town house. 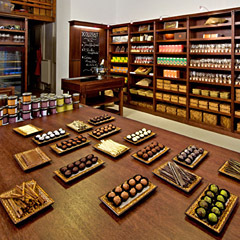 You have a choice of Grand Marnier pralines, whisky truffles, langue de chat, chocolate bars, chocolate spreads, etc. Just in truffles alone, there are ten varieties ranging from the sweet-and-vanilla-herb range to one with a strong 16 year-old Lagavulin Whisky. Even the ingredients, including the spirits that they use in the chocolates are available for sale. Xocolat are in Linz and Baden as well and if you’re impatient to taste their chocolate delights, you can buy their chocolates online.